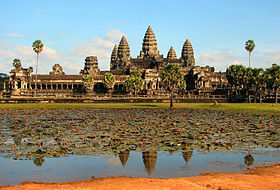 Let’s visit Angkor Wat, a large temple in Cambodia that is the country’s most famous symbol. 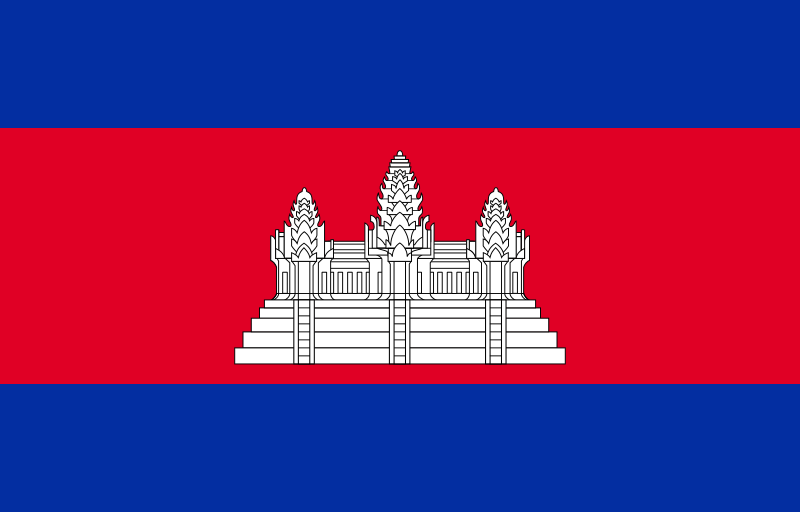 It is also on the Cambodian flag. Angkor Wat was built in the 12th century for a king of the Khmer Empire as part of a huge temple complex in the ancient city of Angkor. Angkor at the time was a huge city, almost the same size as today’s Los Angeles, USA! Angkor Wat is built as a 3-level pyramid representing a mountain that was home to the Gods in Hindu mythology. It has five towers and it is surrounded by a moat. All along its walls are beautiful detailed carvings that tell stories from the Hindu religion and other events. It was built as a Hindu temple and was later used as a Buddhist temple. We don’t know why but the city of Angkor was abandoned around 1500 AD. Over the next four hundred years, the thick jungle around Angkor completely covered the city and its existence was forgotten. French missionaries found it in 1860, and over the years, several of the old temples have been uncovered. Here is a video about Angkor Wat. If you’d like to build a paper model of Angkor Wat, you can go here.